I decided to create this journal, it is a record of the books that I have read. I keep information about the author, characters and plot, along with a personal review of each book. It’s nice to be able to look back on all of the books I have read throughout the years. This way I’ll have the story without the actual novel or autobiography taking up space. Except of course for those must have classics or collectibles. 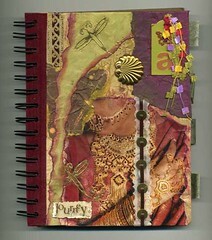 I used heat embossing, stamping and decoupaging to complete the cover of this journal.